The area to be treated is numbed before treatment takes place so there is minimal to no pain. Most areas can be treated within 30-60 minutes. Because this is a medical treatment, clients need to be aware that there is some downtime with the healing process. Everyone is different but generally there is swelling, crusting and general tightness which can be a bit tender for about 5 days. We do not advise using make up to conceal this as applying anything to the skin can hinder the healing process and could cause an infection. A full consultation and test patch of the topical anaesthetic cream is required before treatment. Due to the nature of the treatment we’ve created a small FAQs below to answer some of your questions before you book your appointment. If you still have more please don’t hesitate to contact us and we’ll get back to you as soon as possible. What conditions can be treated with the plasma pen? How is the plasma pen treatment performed? What are the complications with the plasma pen treatment? There are 4 states of matter. Solid, liquid, gas and plasma. Plasma energy is created when a gas passes through an electromagnetic field to create ionised gas particles in the air between the device tip and the skin.The tiny holes created in the skin with the plasma pen turn solids into a gas. Therefore, the plasma energy turns the skin to a gaseous state. This process is called sublimation. When the skin is treated via sublimation, the elastic fibres shrink. This tightens and retracts the skin. The results of this treatment are similar to those of surgery but without the scarring or lengthy downtime.It is important to note that the plasma treatment does not damage the surrounding skin. A topical anaesthetic cream is applied half an hour before the treatment. While the treatment is relatively pain-free, sublimation does result in a smell similar to burnt hair. You will be swollen for about 2 days post treatment and small carbon crusts will appear, lasting 5-10 days. These scabs will fall off naturally so do not pick them. Use you Plasmacare aftercare products. Once the crusts have fallen off, there will be mild redness for about one month. It’s important not to scratch or pick at the skin during this time, to prevent infection, pigmentation or scarring. We do not advise the application of make up whilst the crusts are present. The make up could cause irritation and introduce bacteria into the delicate skin and, the removal of the make up could interfere with the healing process of the crusts. Full aftercare advice and Plasmacare products are include in your treatment. There will be some initial, superficial results which are apparent immediately. The skin will appear tighter and some lines will be diminished. The next stage of results should be visible after about 2-4 weeks and they will continue to improve as new collagen fibres are formed at about the 3 month. 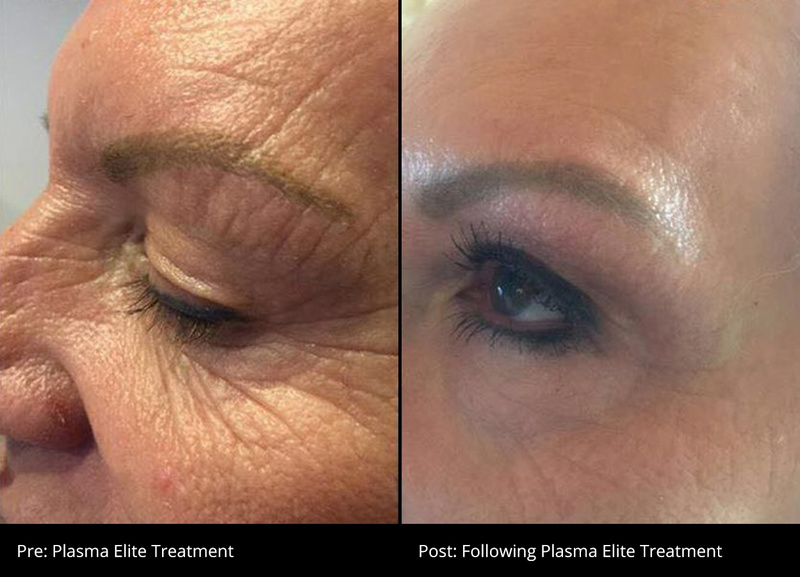 It is important to note that the Plasma Elite II Pen treatment will not stop the onset of further ageing. Factors such as smoking, excessive alcohol consumption, poor diet and sun damage can all contribute to further ageing of the skin. Results are expected to last 2-3 years, and the treatments can be repeated. The treatment is very safe, however, on rare occasions, you can get skin hypo-pigmentation (whitening) or hyperpigmentation (dark patches- generally more common in darker skins).Because of the risk of pigmentation issues, we do not advise anyone with a darker skin type to have this treatment.In patients with lighter skin, you can get persisting redness for a couple of months after the procedure. The number of sessions needed to get the best results will depend on the severity of the loose skin. One treatment is generally enough to see improvements in most people but it will depend on the skin quality, severity of wrinkles and the client’s expectations. A follow up appointment is made at 6 weeks and 3 months. It can take upto 3 months for the new collagen fibres to form. It is at this stage that a second or even third treatment can be undertaken to achieve the desired outcome. Results can last about 2-3 years.